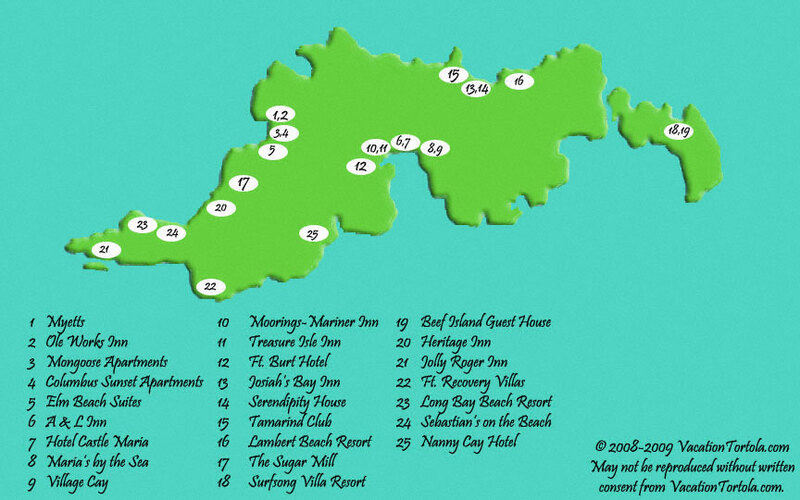 The Tortola hotels map often solves one of my problems. You see, I sometimes have trouble locating exactly where my hotel is. Many times it becomes a guessing game depending on which place I decide to stay, but this map takes all the guessing out of the equation. Check this map against the beaches map to see if you can step right out on the sand from your balcony. Look at the map along with the hotels page to see the reviews of your possible accommodations. Don't forget to look at the Virgin Islands map to find out where to catch the ferry, or if you just like a better view of the BVI take a look at this map.